In this particular blog we will dive into a very useful concept i.e. "String Handling in Java". In simple words a string can be defined as a sequence of characters, but in Java it a String is more than that of just a sequence of characters it covers a very wide area. There are a lot of operations and implementations that can be performed on String. In Java String is an immutable object, we will look into 'what immutable means exactly ?' in a few seconds. In today's discussion we will try to cover all concepts and operations that can be performed on String objects. In the last part of the tutorial we will cover "what is StringBuffer and StringBuilder class ?" and how these two classes differs from String in aspect of operations and performance. In this method we creates a String type object and assign a sequence of characters to it enclosed within " ". Whenever a new string is created using String literal a object is created in String constant pool, String constant pool resides under heap memory. 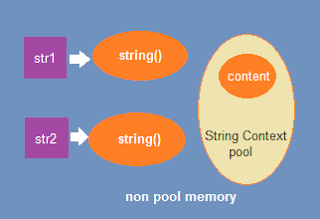 If a string with same content is already available in the pool than new String type variable points to the object that is already there in the memory and new object does not created. As shown in above example, two code lines are creating a string having same content i.e. "javaguys". Therefore two reference variables will point to same object as shown in the figure below. As we already knows that while comparing Strings, "==" checks for references and ".equals()" checks for content. In case of 's' and 's1' both will return a true. because the two variables are pointing to same object and having same content as well. 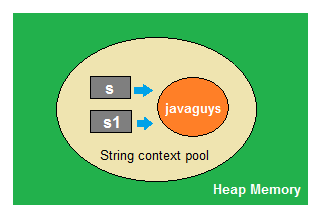 In this statement two objects and a reference variable is created, One object of String class is created in simple non pool memory and second object is created by "javaguys" value. This time the reference variable points to the object in non pool memory and not to the literal object. Every time we created a String object using a new keyword, the reference variable point to different objects no matters if their content is same or not. Although concat operation is performed on S1 object but the changes are not reflected to s1, s1 is still having unchanged value i.e. "being". Here a new object with value "beingjavaguys" is created but reference variable s1 still points to "being". Here we are done with a quick introduction of String in java, we came to know how to create a String in Java and difference between them, we had a look at difference between '==' and '.equals()' methods. In upcoming blogs we will see basic operations of String and difference between String and StringBuffer class.